I have been working on some scamps and rough sketches which feature quills this month. It reminded me of the work that I did years ago for the Cumbria Life magazine (based in Cumbria and the Lake District). My good friend, Cherry, was working for the magazine at the time and commissioned me to do a series of illustrations for some key regular features in the magazine, such as: antiques, cookery, books and literature etc. I didn’t have a great deal of time to do the illustrations, as I was working full time in a college then, but I still managed to meet the deadlines and produce a series of illustrations. The magazine was (and still is) a lovely and glossy publication – filled with gorgeous and sumptuous photographs and features, so I chose to do something that would look noticeably different on each page, but tied in with the heritage and roots of many of the readers. I chose a woodcut or linocut design, which I actually drew by hand (not having the time to create linocuts) to give the effect of the illustration being printed by such a technique. Quills are beautiful to draw with and the illustrations were all drawn with quills, most of them modern ones, rather than the traditional goose feather variety. My love of red squirrels was abounding at the time, so I featured a bookend in the form of a red squirrel. This is an actual bookend that my father, Robert W. Nixon created for me and I incorporated into the illustration. I then added in the quill, books and ink pot with a quirky ragged border to group the components together. 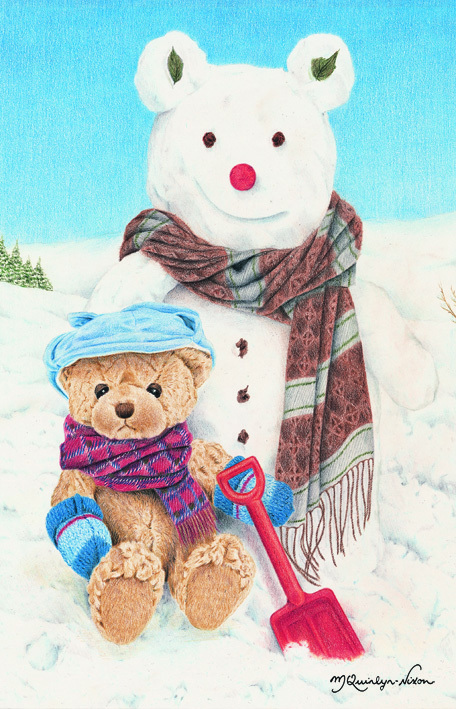 The Snowbear illustration was one of the first illustrations that I drew when I started my Bear-a-thought calendars in 2002. Just looking at this illustration that I did 15-years ago on this date in 2001 (can’t believe it was that long! ), I can still remember so much about my life then and what I had to do to create this illustration. I remember it had snowed hard in Durham that year and it was an ideal opportunity to get some snowy pictures. I stumbled out into the garden one morning, donned with gloves (fingerless ones, which are the only ones I can wear) and made my self a snowman, or more correctly a snowbear. I tried to make him teddy bear size (or just a bit bigger), so that he didn’t overpower the bear that I had in mind to draw with him. After making my snowbear, which called on me to improvise with his features, using leaves for inside his ears and buttons, a cherry-chocolate covered in red foil paper for his nose and some well-known chocolate wrappers for his eyes, I draped a favourite scarf around his shoulders to create that casual, snowbear-around-town look. All that was left was to position my teddy bear, Augustus, in front of my cold creation. I think the addition of the spade was an inspiration and made it look like little Augustus had been hard at work at his snow sculpture. This was the first illustration to be seen in my very-first calendar and was the first of many, as I had no idea at the time just how popular these illustrations would become or how many different parts of the world would get to see them.